There is no better summer destination than the beaches of the Caribbean. Book this Delta Airlines airfare from Dallas to Saint Maarten and save a lot on your flight – with Delta you pay $510 for a ticket, while a flight with the next cheapest airline is $580, $70 more expensive. Faredepot provided this flight that we have found on Travelgrove. Search the same site to find this offer, but also select the other providers for a price comparison, maybe someone has an even better Dallas to Saint Maarten deal than the one we have found! Your plane leaves Dallas/ Fort Worth International Airport (DFW) on May 16 and flies back from Princess Juliana International Airport (SXM) on May 22 2014. The flight has one stop in New York with a layover of 9 hours 5 minutes on the way to Saint Maarten and 11 hours 40 minutes on the way back. Booking this flight will get you 6,142 award miles from the Flying Blue Air France & KLM frequent flyer program. Delta Airlines is $70 cheaper than any other airline company with flights on this route. Check out the other airlines’ rates on the table and get the cheapest flight to Saint Maarten as soon as you can! *Airfare prices shown in the table include taxes and fees. 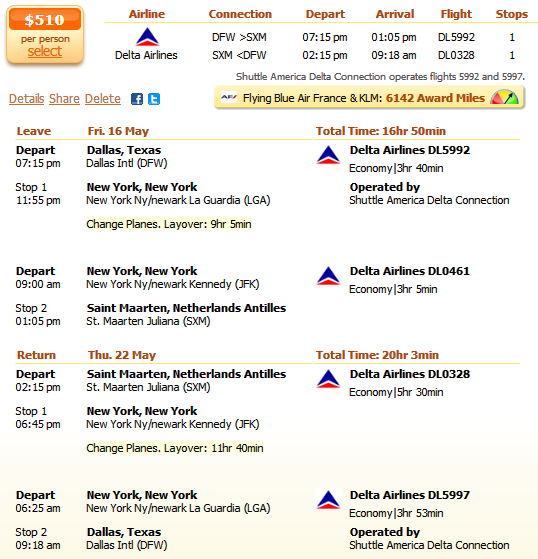 This entry was posted on Tuesday, April 22nd, 2014 at 10:46 am and is filed under Airfare Deals. You can follow any responses to this entry through the RSS 2.0 feed. You can leave a response, or trackback from your own site.